Just finished reading the Rift Walker, the second in the Greyfriar series by Clay and Susan Griffiths. 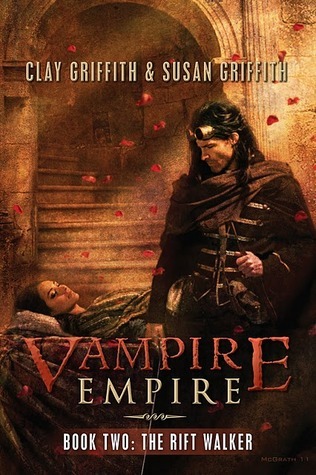 Whilst the first book threw us straight into a dark and violent world, where vampires rule and the vast majority of people have become little more than cattle with no sense of hope, the second is a much deeper exploration into the world created and in particular a good look at Princess Adele. If you haven’t read the first book yet this will undoubtedly contain spoilers so be warned. The story picks up a few months after the conclusion of The Greyfriar. Adele has been returned safely to Equatoria where she is being given some time to recover from the ordeal she suffered at the hands of the London vampires. The plan maybe for Adele to marry Senator Clarke (a marriage that will unite these two countries against their common enemy) but it is the Greyfriar who has caught the attention of the people. They’re desperate for a fairytale romance between their Princess and the dashing swordsman who fearlessly stalks and kills their enemies. Senator Clark, however, is not to be so easily deterred and he strong-arms the Emperor into setting a date for their nuptials, much against Adele’s wishes. The wedding date looms and I admit that I think I had as much a sinking feeling about it as Adele. Things don’t go as planned though and following a dramatic entrance the Greyfriar whisks Adele away under the very nose of her would-be husband and all their guests. From there onwards the pair have a lengthy journey to make that will take them over some fiercely hot climates and seriously test the Greyfriar’s (otherwise known as Prince Gareth) resolve and also give a bit more weight to why the myth of vampires not liking sunlight might have grown. They need to get to a more friendly shore and throw themselves upon the mercy of a ruling king who may be prepared to harbour them – there’s no such thing as a free lunch though and any safe haven will undoubtedly have hidden provisos. I have to admit, and I don’t think of myself as particularly a romance reader, but I do like the romantic elements to this book. I will quickly just say that they’re not overdone – this is no bodice ripper and there’s no mushy vomit inducing lovey-dovey scenes (so relax on that front). 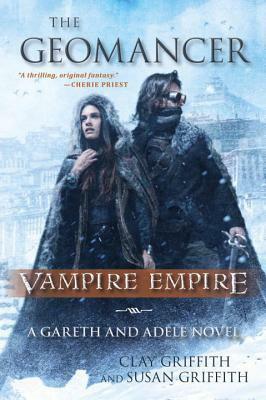 The main focus of the story is the potential war between Vampires and humans and the role that Adele and Gareth will play in that event. Basically, I just like the two of them together and it’s interesting to watch the struggles they have to put up with in that respect. It’s not easy loving a vampire in a vampire hating world! It’s even less easy to keep a secret when there’s a bunch of geomancers around. On top of that the very nature of Adele and the magic she seems to be capable of is almost like a poison to Gareth and adds yet another level of difficulty to their being together and then there’s the element of duty that both of them are so very conscious of. I thought their relationship really came along in this book. They have more time together and more dialogue and frankly they can be pretty amusing. There’s also plenty of travelling with the pair this time around going from Equatoria to Egypt and then further afield where they end up scaling a freezing cold mountain to battle with another clan! I was particularly interested in the differences between this particular clan and the vampires from London. So, we have plenty of travelling, a little romance and much action. The story moves forward at a great pace and there are some really dramatic scenes to take in, some of them not shy on bloodshed. There’s a great combination of steampunk, alternate history and horror but it’s all tempered with the budding romance and the very engaging chemistry between the two characters. I couldn’t help having a bit of a giggle when Senator Clark and Gareth finally clashed! I thought this was a great second instalment with a much deeper look into the world created by these two authors. It ends on a real bombshell but fortunately I already have No.3 waiting to be read. Happy days. I received a copy of this from the publisher for which my thanks. The above is my own opinion.